The emergence of the Book of Mormon from its hiding place began on September 21, 1823. That night, the angel Moroni appeared to a young Joseph Smith, told him that “God had a work for [him] to do” (Joseph Smith—History 1:33). That work would involve translating “a book deposited, written upon gold plates, giving an account of the former inhabitants of this continent”—what we know today as the Book of Mormon (v. 34). The next day, on September 22, Joseph went to the hill and “made an attempt to take [the plates] out” but was forbidden by Moroni, who reminded him that “the time for bringing them forth had not yet arrived.” Joseph would have to wait “until four years from that time” but was to “come to that place precisely in one year from that time” and to return each year “until the time should come for obtaining the plates” (Joseph Smith—History 1:53). Moroni’s annual visits occurred generally around the time of the Israelite harvest festival season. The initial visit on September 21 in 1823 coincided with that year’s celebration of the Feast of Tabernacles. In 1824, September 22 was the eve of the Jewish New Year (Rosh Hashanah) and the beginning of the fall festivals. In 1825, September 22 was precisely Yom Kippur (the Day of Atonement). 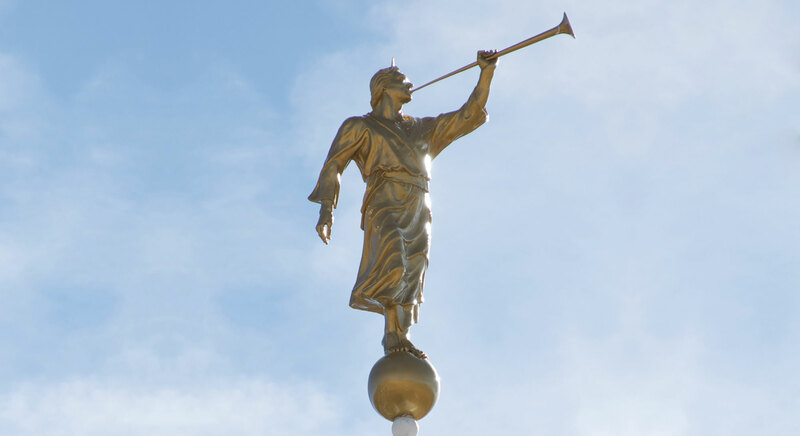 In 1827, when Moroni finally delivered the plates to Joseph (Joseph Smith—History 1:59), his timing on September 22 coincided exactly with Rosh Hashanah, also known as the Feast of Trumpets. The Feast of Trumpets signifies the time of Israel’s final harvest; the Day of Remembrance of God’s covenants with Israel; the announcement of revelation or truth; and preparation for God’s holiest times, including the Messianic Age. Other themes include solemn admonitions and warnings, covenant making, remembrance, sacrifice, prophecy, a new beginning, and God’s involvement in history. Though it is hard to be certain whether all of these themes were part of the New Year celebrations in Old Testament times, they were all part of long-standing Jewish customs and traditions by the time the Book of Mormon came forth. When the Book of Mormon’s message and purpose, along with Moroni’s counsel to Joseph during his September visits, are compared with these holy festival themes, one can see a number of interesting connections. For example, Moroni’s visits to young Joseph Smith included solemn words of admonition and warning to all the world (Joseph Smith—History 1:42, 46). The coming forth of the Book of Mormon can also be seen as initiating the final harvest of souls, renewing God’s covenant with Israel, offering a new revelation of truth, and as being clearly tied to the second coming of Jesus the messianic Christ. No bolder statement could be made about God’s involvement in history than that of an angel delivering a historical record full of interactions with God—including the stunning account of the divine and risen Lord Jesus Christ ministering personally to the Nephites (see 3 Nephi 11–27). Perhaps most relevant of all, the coming forth of the Book of Mormon launched a new beginning—the dawning of a day when the heavens are opened again. No doubt many likely reasons can be suggested for the timing of Moroni’s visits to Joseph Smith each year in late September and also for his particular insistence that Joseph wait four years before recovering the plates. For example, that waiting period allowed Joseph Smith time to mature a bit more, to be married, and to be periodically instructed by Moroni. But perhaps most striking of all, one further reason could have been so that his instructions would closely coincide with the sacred Israelite autumn festival season, with him delivering the plates right on Rosh Hashanah. The number of meaningful ways in which the messages and purposes of the Book of Mormon coincide with the themes of Rosh Hashanah and the Jewish high holy days suggest that this timing was no coincidence, but that Moroni had carefully and deliberately scheduled his meaningful visits. For these reasons, there was no better day on which to commence the coming forth of the Book of Mormon than Rosh Hashanah, September 22, 1827. Christopher Kirkland, “The Relationship Between Rosh Hashanah and Mormon Temples,” Mormon Writers, September 21, 2015, online https://medium.com/mormon-writers. It is also the fall equinox, which some have argued is evidence of “magical” influence on Joseph Smith. See D. Michael Quinn, Early Mormonism and the Magic World View, revised and enlarged edition (Salt Lake City, UT: Signature Books, 1998), 141–144; Dan Vogel, Joseph Smith: The Making of a Prophet (Salt Lake City, UT: Signature Books, 2004), 43. Joseph Smith was involved in treasure seeking and other “magical” practices, and perhaps saw significance in this timing. Mark Ashurst-McGee, “Moroni as Angel and as Treasure Guardian,” FARMS Review 18, no. 1 (2006): 34–100 suggests that Joseph Smith’s understanding of Moroni and his mission likely included elements of the “treasure guardian lore,” while still recognizing that Moroni was a divine messenger from the Lord. Yet Ashurst-McGee felt the connection to treasure seeking and the timing of Moroni’s visits has been overstated (see pp. 92–94). On Joseph Smith and treasure digging/“magic”, see Richard Lyman Bushman, “Joseph Smith and Money Digging,” in A Reason for Faith: Navigating LDS Doctrine and Church History, ed. Laure Harris Hales (Salt Lake City and Provo, UT: Deseret Book and Relious Studies Center, Brigham Young University, 2016), 1–5; Brant A. Gardner, The Gift and Power: Translating the Book of Mormon (Salt Lake City, UT: Greg Kofford Books, 2011), 3–134. See Book of Mormon Central, “Did Jacob Refer to Ancient Israelite Autumn Festivals? (2 Nephi 6:4),” KnoWhy 32 (February 12, 2016); Book of Mormon Central, “Why Did the Nephites Stay in their Tents During King Benajamin’s Speech? (Mosiah 2:6),” KnoWhy 80 (April 18, 2016). Lenet Hadley Read, “Joseph Smith’s Receipt of the Plates and the Israelite Feast of Trumpets,” Journal of Book of Mormon Studies 2, no. 2 (1993): 111. For these and many more, see John W. Welch and J. Gregory Welch, Charting the Book of Mormon: Visual Aids for Personal Study and Teaching (Provo, UT: FARMS, 1999), chart 88, cf. charts 89–91. Also see Terrence L. Szink and John W. Welch, “King Benjamin’s Speech in the Context of Ancient Israelite Festivals,” in King Benjamin’s Speech: “That Ye May Learn Wisdom”, ed. John W. Welch and Stephen D. Ricks (Provo, UT: FARMS, 1998), 160–74. In his initial visit, Moroni warned that many of the prophecies of judgment in the final days are near at hand (Joseph Smith—History 1:27–42, 45). The introduction to LDS editions of the Book of Mormon, hails the Nephite record as a sign “that The Church of Jesus Christ of Latter-day Saints is the Lord’s kingdom once again established on the earth, preparatory to the Second Coming of the Messiah” (Introduction). See Roy A. Prete, “God in History? Nephi’s Answer,” Journal of Book of Mormon Studies 14, no. 2 (2005): 26–37, 71.